Understanding Financial Statements - Analyzing Financial Statements can be easy! Understanding financial statements is crucial if you want to be a Fundamental investor and a Value Investor. And if If you want to learn how to get rich and cut down on the risk and have money work for you, you need to think in cash flow & financial statements. Cash flow is what brings you wealth. Cash flow is motion, it keeps you moving forward and gives you momentum. Financial statements are your report cards...they tell you where a company is now and where they may go in the future. Financial statements (or financial reports) are formal records of the financial activities of a business, person, or other entity. All the relevant financial information of a business enterprise, presented in a structured manner and in a form easy to understand, are called the financial statements. Balance sheet: also referred to as statement of financial position or condition, reports on a company's assets, liabilities, and Ownership equity as of a given point in time. The balance sheet is a snapshot, representing the state of a company's finances at a moment in time. By itself, it cannot give a sense of the trends that are playing out over a longer period. For this reason, the balance sheet should be compared with those of previous periods. It should also be compared with those of other businesses in the same industry, since different industries have unique approaches to financing. The balance sheets gets its name from the fact that the two sides of the equation above – assets on the one side and liabilities plus shareholders' equity on the other – must balance out. A company has to pay for all the things it owns (assets) by either borrowing money (taking on liabilities) or taking it from investors (issuing shareholders' equity). For example, if a company takes out a five-year, $5,000 loan from a bank, its assets – specifically the cash account – will increase by $5,000; its liabilities – specifically the long-term debt account – will also increase by $5,000, balancing the two sides of the equation. If the company takes $10,000 from investors, its assets will increase by that amount, as will its shareholders' equity. All revenues the company generates in excess of its liabilities will go into the shareholders' equity account, representing the net assets held by the owners. These revenues will be balanced on the assets side, appearing as cash, investments, inventory, or some other asset. 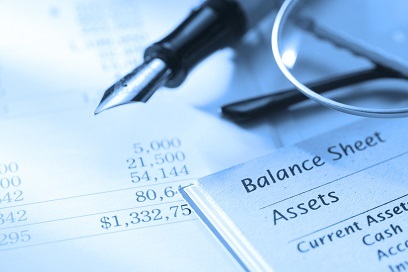 Understanding the balance sheet is important for understanding financial statements. Income statement: also referred to as Profit and Loss statement, it reports on a company's income, expenses, and profits over a period of time. An income statement is a financial statement that measures a company's financial performance over a specific accounting period. Financial performance is assessed by giving a summary of how the business incurs its revenues and expenses through both operating and non-operating activities. It also shows the net profit or loss incurred over a specific accounting period, typically over a fiscal quarter or year. Understanding an income statement is essential for understanding financial statements for investors in order to analyze the profitability and future growth of a company, which should play a huge role in deciding whether or not to invest in it. In the context of corporate financial reporting, the income statement summarizes a company's revenues (sales) and expenses quarterly and annually for its fiscal year. The final net figure, as well as various other numbers in the statement, are of major interest to the investment community. Statement of retained earnings: explains the changes in a company's retained earnings over the reporting period. The statement of retained earnings is prepared in accordance with generally accepted accounting principles (GAAP). The statement of retained earnings reconciles the beginning and ending retained earnings for the period, using information such as net income from the other financial statements. Statement of cash flows: A cash flow statement is one of the quarterly financial reports any publicly traded company is required to disclose to the SEC and the public. The document provides aggregate data regarding all cash inflows a company receives from both its ongoing operations and external investment sources, as well as all cash outflows that pay for business activities and investments during a given quarter. Because public companies tend to use accrual accounting, the income statements they release each quarter may not necessarily reflect changes in their cash positions. For example, if a company lands a major contract, this contract would be recognized as revenue (and therefore income), but the company may not yet actually receive the cash from the contract until a later date. While the company may be earning a profit in the eyes of accountants (and paying income taxes on it), the company may, during the quarter, actually end up with less cash than when it started the quarter. Even profitable companies can fail to adequately manage their cash flow, which is why the cash flow statement is important in understanding financial statements: it helps investors see if a company is having trouble with cash. A must read that will help you out in analyzing and understanding financial statements, is the classic book: Security Analysis. This "Bible" of fundamental analysis has sold over 800,000 copies since its first printing nearly 50 years ago. Here are explanations of every tool imaginable for securities analysis including financial statements analysis, methods to measure asset values and cash flows, profitability and growth ratios, analysis of fixed income securities, and more. Examples of financial statements are given to help you along with your education of reading financial statements. Understanding financial statements will not only help you to pick fundamentally sound companies, but also help you manage your own financial well being and your own personal financial statements. Learn To Find Value Stocks Like Warren Buffett Does! Return from "Understanding Financial Statements" to "Stock Valuation and Fundamental Analysis"
Return from "Understanding Financial Statements" to the Home Page: "Stock Market For Beginners"